Aemlia is a hotel which is based only two minutes away from the city edge and it only takes ten minutes to walk to the main square. It offers free WiFi, a buffet selection for breakfast and a lovely roof top deck so you can enjoy the views across the city. The staff are friendly and hope to see you soon. The Hotel Cosmopolitan Bologna is located outside of the city but it is still convenient to the town centre. It is easy to find and the parking there is also convenient. The rooms are comfortable and include coffee and tea making facilities. The owners welcome feedback and always look to improve their services and facilities. The Sav Hotel is located in a really convenient location, ten minutes from both the airport city centre. The staff are really friendly and helpful and the atmosphere and décor are lovely. 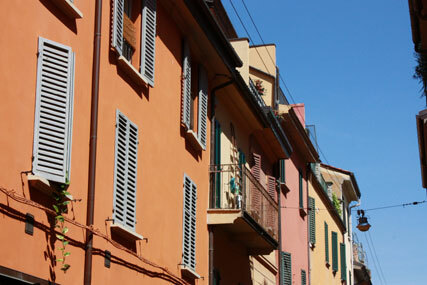 The owner boasts the fact that the Sav Hotel is only 2 kilometers from the main street of Bologna. The Grand Hotel Majestic is a stylish hotel that boasts large, well decorated rooms. It is said to be a luxury in the heart of Bologna. Because of its location many guests prefer this hotel over others as it is right in the city centre. The staff are lovely and the food is good. This hotel is said to be wonderful with friendly staff who go out of their way to make you feel comfortable and to offer you services to make you stay stress free. It is not a very expensive hotel but it is a very good hotel and has a wonderful restaurant. The Palazzo Loup is a great hotel in a beautiful location. It is located on top of a hill right outside of town and boasts amazing views. It also offers great Italian cuisine at the restaurant. This hotel is said to be amazing with fantastic staff. This hotel is located in the city centre and is very close to the main attractions. The staff are friendly and helpful and the suites are beautiful. It is a very modern and up to date hotel and there is even breakfast included in your stay. This hotel has rooms that are very modern in dark colours and it offers free parking out the front of the hotel. They also offer a nice selection of foods for breakfast and wireless internet. It is a well priced hotel. The Al Cappello Rosso hotel is located in a nice quiet street near the middle of the town. It is not very modern but it is clean and comfortable with more of a boutique style. They offer breakfast and the staff are friendly and willing to help you. The Art Hotel Commercianti is a pleasant hotel right in the heart of the city. The building is ancient looking and the rooms that it offers are large and comfortable. The staff are accommodating and the food is flavoursome. Main attractions in Bologna and why to stay here. What to eat in Bologna. Bologna in the last 20 years has became the mecca of the food lover and foodie travellers. With its world wide reputation for food food it never fails to attract and surprise gourmet eaters from the U.S.A, Canada, Australia, Japan, Russia, China and so on. We have seen all nationalities coming here just for one reason EAT! Bologna is big for its fresh egg pasta and it comes in literally 100 of variation with matching sauces. Winter or summer you should not fail to try the Tagliatelle alla Bolognese (please do not ask for Spaghetti with Bolognese sauce as it is not an Italian dish but an approximation invented abroad), then you will want to try the lasagne, tortellini and tortelloni, quaretti, maltagliati and so on. A less known dish by the visitor but extremely popular in Bologna or Modena are the crescrentine or sometimes called tigelle . Small breads that back in the days were baked by the fireplace sandwiched between round shapes of clay and they constitute the staple meals for the farmer and their families. 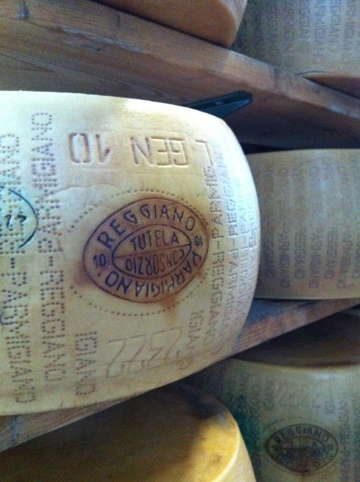 Nowadays they are served with all sort of cured meats. Gnocco Fritto or crescentine fritte. This is the bad boy of the Bolognese cooking style, as it is flour dough fried in lard, it is divine with prosciutto and it should not be missed for any reason. It is also very common in Modena and Parma, here you will find that it called torta Fritta. This slow cooked pink sausage is know all over the world in its copycat versions which simply ruined this popular salumi in Italy. Now the real mortadella di Bologna is protected by the IGP label from the Italian government. The Indicazione di origine protetta indicate that the sausage is produced following a traditional recipe using only prime lean pork cut, then ground very finely which will give the pink appearance, and slowly cooked for 72 hours, the only ingredients should be pork, and salt. However it is very likely to contain nitrates added as preservative. It can be eaten finely sliced or cubed. What to see in Bologna. After many heavy meals in Bologna you will soon find out that you will need to move a little to shed off the calories. 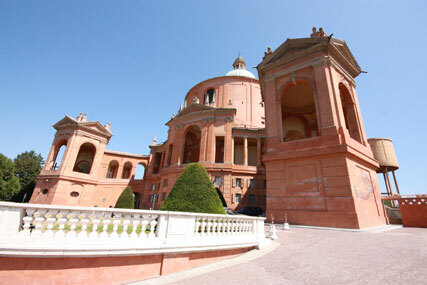 In Bologna the best activity to do so it is to take a walk to the church of San Luca, which is the orange building that you see on the top of the hills surrounding Bologna. The porticoes stretch from the centre of the town and go all the way to the top, it is about 4 km of steep uphill walk. If you do not feel so adventurous you can take the tourist train from the central square. Other urban adventures are the torre degli Asinelli, one of the 2 tours adjacent to Piazza Maggiore has several 100 steps all the way to the top, once representing one of the powerful Bolognese family now offers visitors breathtaking views of the city. Along the Piazza Maggiore don’t miss the Jean de Boulogne fountain, San Petronio one of largest churches in Italy, and finally the room of the Spellati in the oldest university in the western world. It is a room in the faculty of medicine with two statues of man without their skin to expose the underneath muscles to the students. Where to sleep in Bologna. Bologna is a major transport hub in Italy, with a large train station, one airport and one major motorway if you are travelling from north to south and vice versa you got to pass from Bologna. Hotels tend to be fairly price compared to most the other tourist part of Italy, however in September you might find it expensive as there many exhibition around that period, in this case you can stay in Modena which is only 20 minutes by train and it has many very good quality hotels. If you stay in Bologna it is best to book one of the hotel around the station, or around Piazza Maggiore, but remember if you are driving there in a no traffic zone in force so make sure that you know where you are going. We recommend the Grand Majestic Baglioni that it is the city 5 star hotel with all the luxurious comfort that you will ever need. La Una, Starhotel excelsior and Mercure hotel are all very similar and right in front to the station. The Zan Hotel and 3 Vecchi are also popular choices are all very similar in standard. Where to eat in Bologna. Diana and Caminetto d’oro have been the best and most renowned restaurant in Bologna for many years but you will find that the prices have also risen and they are not that reasonable any more. If you are looking for somewhere where the locals eat I would recommend Trattoria Anna Maria Via delle Belle Arti 17, open for lunch. For the evening you can try Taverna dei Lords in Via Nazario Sauro, here you can try many of the pasta dishes from the Bologna cuisine. Emilia Delizia organises cookery classes in Bologna with a tour of the local market, student who want to be chef for one day can prepare fresh egg pasta with our professional chef. We can take solo travellers and larger groups anyone is welcome. Emlia Delizia also pick up small or larger parties for our 3 food gourmet food in one day, with departure at 7.15 from your hotel or nearby location we will take you to visit the Parmesan cheese production, a balsamic vinegar producer with tasting and finally an organic winery in Modena or if you prefer to see the Parma ham we can also accomodate that. 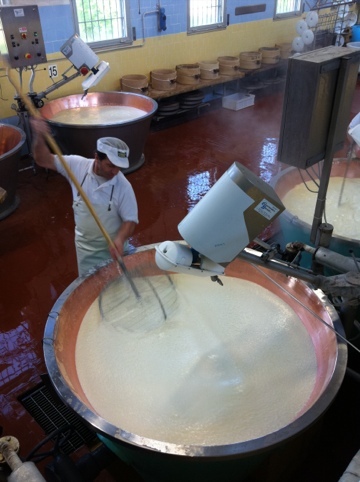 Author gabriele montiPosted on 6 May, 2012 30 July, 2018 Categories Bologna, Gourmet food tours in Italy, Modena, ParmaTags Bologna food tours, italian cheese farm tour, Parma cheese tour, Parmesan cheese tour, parmesan factory tour, parmigiano reggiano tour, parmigiano tours, visit parmesan factory10 Comments on The Parmesan cheese tour – Parma: Parmigiano Reggiano Factory departing from Bologna, Modena, Reggio Emilia.